and hence a quantion is nothing but a \(2\times 2\) complex matrix subject to the usual matrix multiplication. and we can see that P corresponds to parity as it inverts the spatial components while keeping the structural vector \(\Omega \) unchanged because \(\Omega \) corresponds to the local time direction. "\(A\)" comes from the usual inner product of quantum mechanics while "\(M\)" extracts a particular reference frame in relativity. 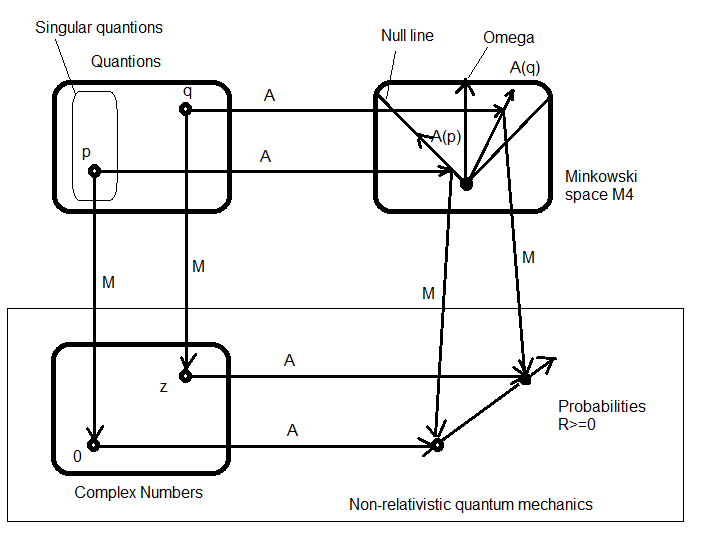 The remarkable fact is that \(A(q) \) is always a future oriented timelike vector and in quantionic quantum mechanics the predictions are 4-vectors: current probability densities. The commutation of "A" with "M" shows that the theory is inherently relativistic. Relativity was not postulated but it comes out naturally. 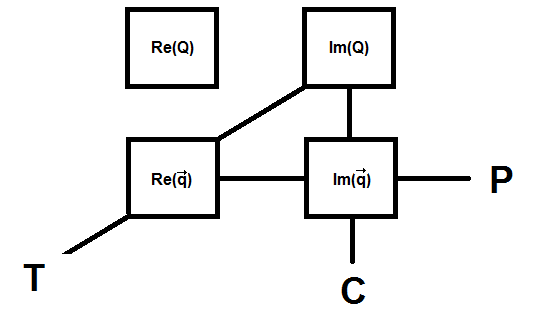 Moreover because SO(2,4) was the unique non unitary group compatible with the observable-generator duality of quantum mechanics, quaternionic quantum mechanics is the only possible generalization of quantum mechanics which is compatible with relativity. This only works in the SO(3,1) space. Is this why there are 3+1 spacetime dimensions? Next time we'll discuss the physics of quantionic quantum mechanics and its relationship with Dirac's theory. Please stay tuned.